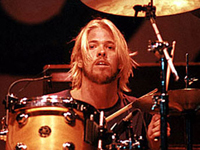 Known principally for his role as drummer for the post-grunge rock act Foo Fighters, Taylor Hawkins was born in Dallas on February 17, 1972. Though born in Texas, Hawkins grew up in the surf and sand of California’s Laguna Beach. Influenced from his youth by The Police‘s Stewart Copeland, Hawkins briefly spent time early in his career honing his skills with the experimental group Sylvia before enlisting in the touring band for Canadian singer/songwriter Alanis Morissette. When the Foo Fighters found themselves suddenly without a drummer in 1997, however, Hawkins jumped at the chance to join the group’s ranks behind the drum kit. Though immensely enjoying his position with the band — and as the Foo Fighters grew to be considerable stars among the alternative rock world of the late ’90s into the 2000s — Hawkins considered himself somewhat of a frustrated songwriter. So in the style of bandmate Dave Grohl (Nirvana drummer turned Foo Fighters frontman and guitarist), Hawkins began, somewhat accidentally, a side project in the summer of 2004 that would eventually become Taylor Hawkins & the Coattail Riders.